After Pom helped me obtain an amulet that was supposed to attract ghosts (see previous blog), all I needed was the right opportunity. 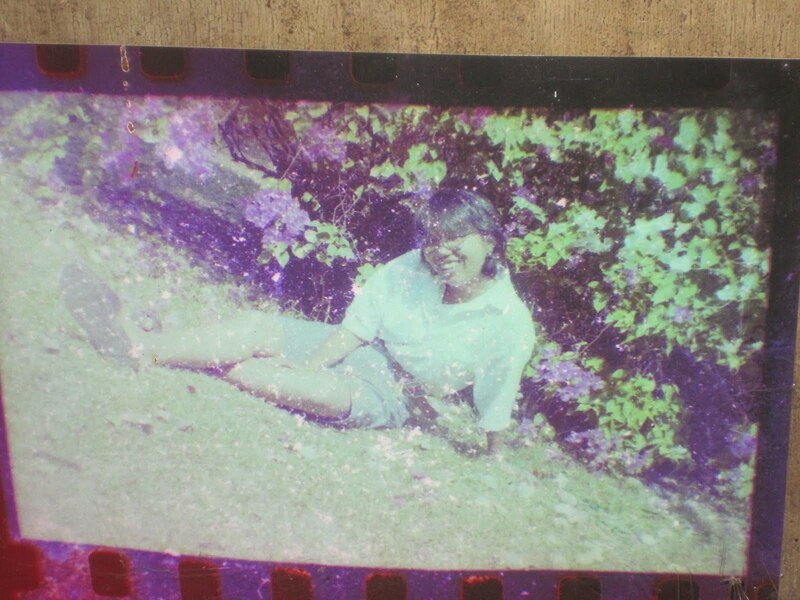 To my surprise, I found it on the campus of Silpakorn University where Mary and I were living while in Thailand. 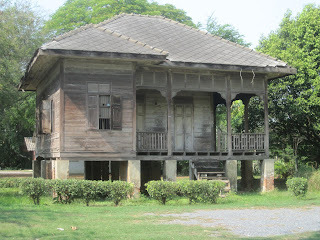 The old, abandoned traditional Thai house on campus is called Reun Prakumsakkee. I discovered that, in 2010, an Italian visiting artist named Alessandra Campoli gave a mixed media performance titled Haunted in the house. By email Alessandra told me that it was necessary to perform a two-day ceremony at the house in order to get permission of the resident spirits to hold the performance there. 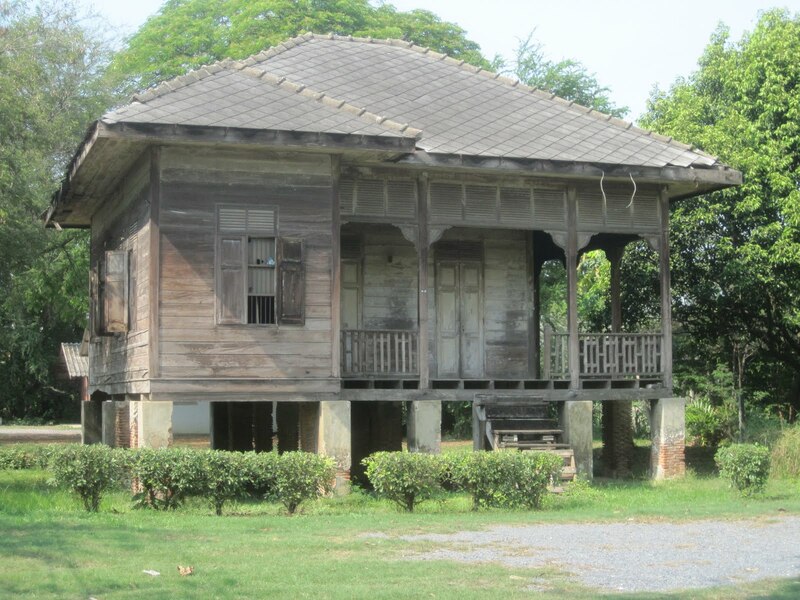 I also heard stories about people seeing a ghostly woman wearing old-style Thai clothing at the house as well as the ghost of a little girl who reportedly fell off a swing and died. Kanyarat Vechasat, a professor of Thai literature and folklore, serves on a committee that protects and preserves such old buildings on the campus. She told me that, at one point, university officials were thinking about relocating the old house. She went to the house and prayed that, if there was a spirit residing there, it should send her a sign. After praying, Kanyarat saw two pythons at the house, entwined and standing upright (almost five feet high!). She took their presence as a sign from the spirit of the house. She told university officials about the snakes and they said that other people had reported the same phenomenon. 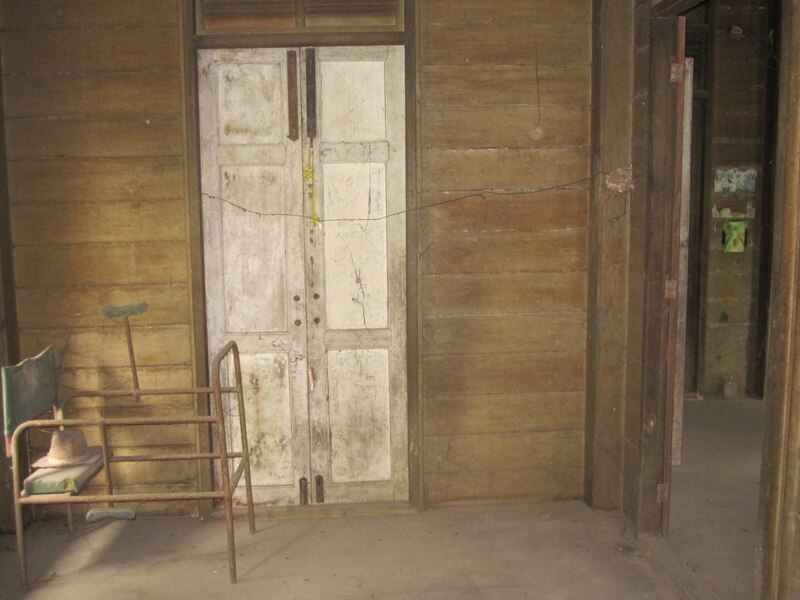 The officials decided that a spirit did, indeed, live in the house and it was not moved. I walked to Reun Prakumsakkee and stood there for awhile looking at it. The house stood in a lot with grass deep enough to hide cobras, pythons, or the ubiquitous water monitors that crept up from the water. 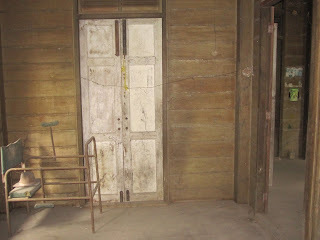 The wooden house was weather-beaten and faded, the shutters over the windows ajar, the windows like empty eye sockets. Raised on pilings several feet above the ground, a splintered wooden pallet leaned against what was left of the stairs, obviously placed there to prevent anyone from entering the house. So, of course, I climbed up the rickety pallet and up the rotting steps, fully believing that I would fall through at any time. I didn’t. Reaching the porch, I opened the door and went inside. Gray light filtered in through the open windows and profound silence settled over the rooms like a shroud. 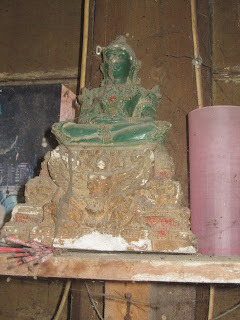 As I walked through the rooms noticed offerings made to the spirits during the 2010 ceremony, including a statue of a Hindu deity riding on a garuda. Photographs of the Thai king and queen and of a mysterious young girl hung on the walls. Some empty liquor bottles stood in a rank upon a shelf. Clearly, the ceremony to appease the spirits had been an elaborate one. 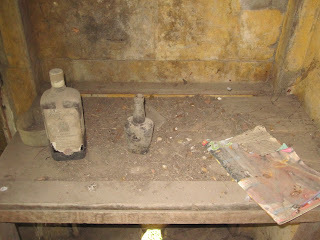 Then it struck me that the spirit still remained in the house. Looks as if that amulet may be coming in handy!